Freely travel between the real world and cyberspace Eden. 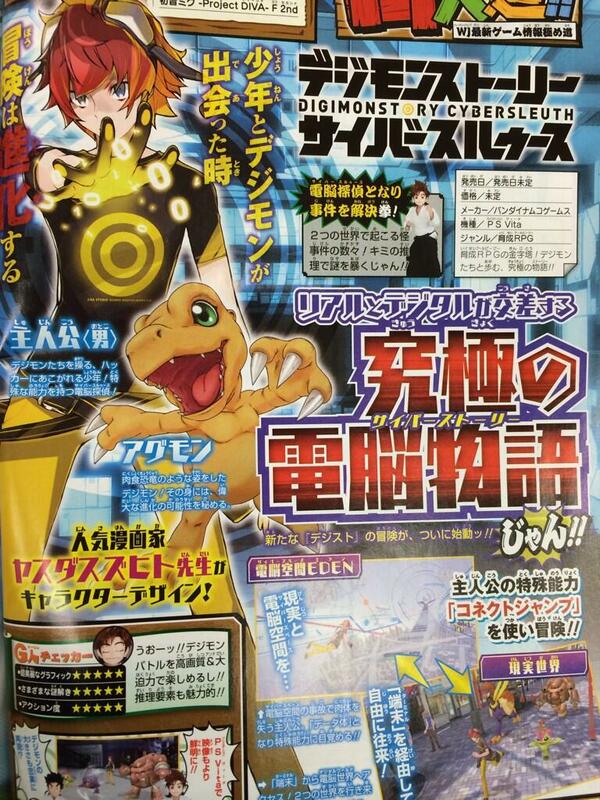 This week’s Jump offers first story details on Digimon Story: Cyber Sleuth, Namco Bandai’s new Digimon game coming to PS Vita in Japan next year. Become a cyber detective and solve the case! A number of incidents are occurring in the real and digital worlds. Reveal the mystery through reasoning. Connect Jump allows him to freely travel between the real world and cyberspace world “EDEN” via the terminal. Real and digital intersect in the ultimate cyber story. Additionally, it’s revealed that Yasuda Suzuhito, known for his work on Shin Megami Tensei: Devil Survivor, Durarara, and more recently Digimon World Re:Digitize, is doing the game’s character designs.